And then there’s Nancy. Constantly shuffling her copy of Trumps’ speech. Too many big words? 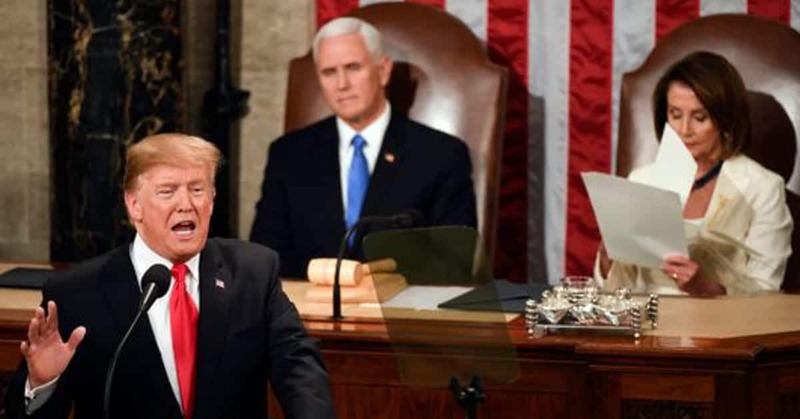 To use a baseball analogy, President Donald Trump “Went YARD” last night giving his State of the Union Address before both houses of Congress. He literally knocked it out of the park and left Democrats’ stuttering, their heads spinning and gasping for a response. The sheer breadth of President Trump’s accomplishments in just two years boggles the mind. Particularly when he has been up against staunch resistance from the Democrats, and even from many within his own party. In response the Democrats were only capable of strutting out a former losing gubernatorial candidate from Georgia to offer the same talking points about “voter suppression” they always promote as excuses for being rejected by the electorate. If Stacey Abrams said anything beyond that it was just as forgettable. If she’s the “rising star” in the Democrat Party as we are being told, Lord help them. But I doubt that’ll happen. The lord doesn’t favor people who support evil in so many ways. Watching the white-clad Democrat women in attendance one could not help but notice that they appeared about as happy to be there as someone sitting in a dentist’s chair after being told that the supply of Novocain had run out. They did not want to be there and have to listen to this president extol the successes his administration has achieved. The type of success that Democrats simply are incapable of understanding, much less achieving. It was also amusing to see the look on the face of the left’s favorite little socialist Alexandria Ocasio-Cortez while President Trump was listing the accomplishments of his administration under Capitalism, as she realized that all the crap her leftist college professors had indoctrinated her with for years was just that, crap. Though she certainly will never admit to that since it would undermine her newfound celebrity which she has quickly grown accustomed to. If there’s a TV camera around little AOC as she is now known will be in front of it, and trying – no matter how incoherently – to explain the virtues of taking money from hard working people and giving it to others who don’t want to work. And then there’s Nancy. My goodness the poor girl simply couldn’t keep her place as President Trump gave his address, she was constantly shuffling her written copy of Trumps’ speech in her hands. Too many big words? Perhaps the president should keep it limited to one syllable words next time, then she can follow along without losing her place. Maybe take notes if she can’t keep up. Or she could just be respectful and courteous and listen. Watching New York Senator Chuck Schumer hunched over in his chair one could not help but envision seeing Batman come swooping into the room and taking a few swipes at his arch enemy the Penguin. The only thing Chuck was missing was a top hat and cigarette holder clenched between his teeth. And the smirk on Schumer’s face when President Trump talked about the murder of infants at the moment of birth now allowed in the states of New York and Virginia tells you everything you need to know about the cult of death that resides within the Democrat Party. A party so controlled by Planned Parenthood’s big money that they refuse to recognize that their silence on the issue is recognition that they support infanticide. The murder of innocents. Simply unconscionable. But I have to say that above all the most enjoyable thing about the SOTU address for me was what was missing. Hillary Clinton. 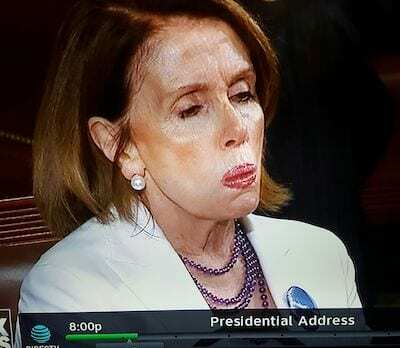 The State of the Union Address wasn’t being given by Hillary Clinton, the most dishonest, corrupt, and despicable politician in American history to ever run for the highest office in the land. For that we can all be thankful.